What does blindness look like ? I have been told many times that I “don’t look blind” or “it looks like you can see” ! I am not sure what blindness looks like but I am taking a guess that they mean my eyes look “normal” I guess besides the incessant bouncing around they do. Blindness comes in many forms, it does not mean that my eyes are cloudy or that I have prosthetic eyes. It does not mean that I look out into space when speaking to someone or that I am not able to look in your direction when having a conversation. These are the farthest from the truth. There are many people who do have “cloudy” looking eyes or prosthetic eyes but not all blind or partially sighted people do. There are many many conditions that cause visual impairments of all levels. Using a white cane or even a guide dog does not mean that the person is completely blind. They may in fact have some degree of vision just not enough to safely move through the streets. With my condition my eyes look “normal” I suppose but if you were to look closely they are probably very different from yours. I have a circular nystagmus that means my eyes constantly move in a circle they never stay still. This causes me to have to turn my head to the side to attempt to see things (this is not very successful at this point but hey I am not a quitter. ) I also have a strabismus which means my eyes don’t always move together when I am looking at you one eye might be looking at you and the other off doing it’s own thing. My pupils are also always very dilated in fact when I go to the eye doctor they usually don’t have to dilate my eyes as they are already quite dilated. My eyes are also a weird colour due to my Albinism. They are kind of green but a muted green colour some people say it is a weird colour. Under no circumstances is it ok for someone to say to a blind or partially sighted person, ” you don’t look blind” or ” it looks like you can see me” . You have no idea what they can see or can’t see and that is quite a personal thing to say and it is offensive. It insinuates you think the person is faking it. This is not something anyone would ever do. 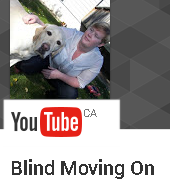 Living life as a blind or partially sighted person can be very frustrating at times it is not worth faking it, and like I said this is very offensive. You must think of it from the perspective of the person you are speaking to. Would you be offended if I said to you ” you don’t look like you are very intelligent” or “you don’t look like you work out”. Think before you speak not only does it make the person you are speaking to feel like crap, but it makes you look like a insensitive twit. I have been running into these things being said to me more and more. It can be very discouraging and makes a person dread going to events because it really gets on your nerves. And what does one really say to a comment like that, that does not make me look and sound like a complete bag. If I can filter the profanity that comes to mind when people speak to me this way then I am hoping people can learn to filter what they say to others.